Create your own sub starting off with just the right bread of white, whole wheat, or onion. 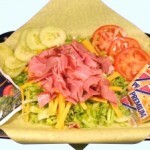 Sub fillers include Swiss and cheddar cheese, tomato, pickle slices, pepperocini and mayonnaise. We’ve got all the extras to top it off for the perfect tasting creation, not to mention fresh, prime cut meats and veggie only selections. When cooler temperatures hit, warm up with one of our famous hot subs or a seasonal fresh bowl of soup. University Hero won’t neglect your sweet tooth either. We are stocked full of cookies, brownies, and more to satisfy all your hunger needs. Come on in or place your order online now! ½ Daily Featured Sandwich, with a side choice of soup, specialty salad, or chips and a regular drink.